If you’re planning to take the Security+ exam, you might like to remember this key point. A quantitative risk assessment uses specific monetary amounts to identify cost and asset values. The SLE identifies the amount of each loss, the ARO identifies the number of failures in a year, and the ALE identifies the expected annual loss. You calculate the ALE as SLE × ARO. A qualitative risk assessment uses judgment to categorize risks based on likelihood of occurrence and impact. This is one of the Remember This blocks from the CompTIA Security+: Get Certified Get Ahead: SY0-501 Study Guide. As a study habit, I encourage readers to repeat these key points to themselves as often as possible. The more you repeat the information, the more likely you are to remember it when you take the exam. The CompTIA Security+: Get Certified Get Ahead: SY0-501 Study Guide provides additional information needed to fully understand this key point. 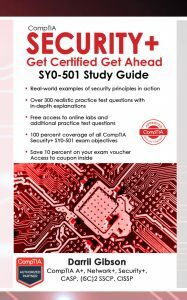 Also, the full text of the top selling CompTIA Security+: Get Certified Get Ahead: SY0-501 Study Guide is available in the Full Security+ Course within an online course format. Bookmark this page and check it next week for another Security+ Key Point. All of the Security+ key points are available as online flashcards here.